The Neal Morse Band To Perform in Cleveland Feb 23rd ! 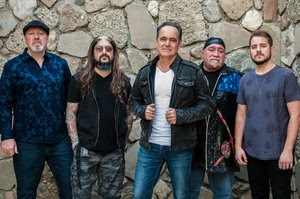 THE NEAL MORSE BAND—singer/guitarist/keyboardist Neal Morse, drummer Mike Portnoy, bassist Randy George, keyboardist Bill Hubauer and guitarist Eric Gillette—who will release their latest double-disc concept album, THE GREAT ADVENTURE, January 25 on Radiant Records via Metal Blade Worldwide. It will be available in three formats: a two CD package, two CD/DVD Special Edition featuring behind-the-scenes video clips of the making of the album, and three vinyl LPs. The follow-up to 2016’s critically acclaimed THE SIMILITUDE OF A DREAM, which critics hailed as “a masterpiece,” will be the ninth studio album with Morse, Portnoy and George, and the third as a true collaboration with this current lineup. Together, Morse and Portnoy have launched four bands, but the one that has endured the longest and thus with the most musical output has been THE NEAL MORSE BAND. They’re performing in Cleveland, OH on Saturday, February 23 at the Beachland Ballroom. This promises to be a night of musical wonder , make sure your put it on your concert list !